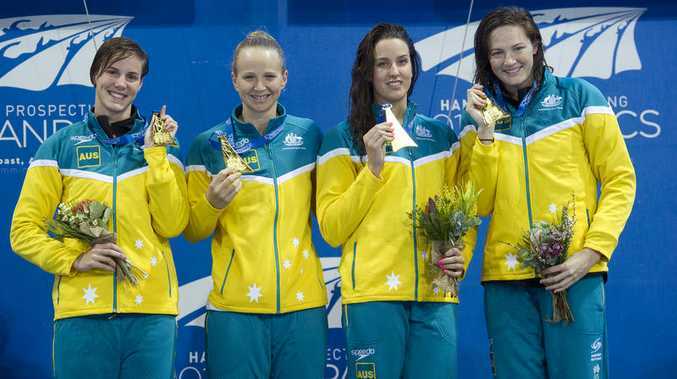 BRISBANE resident Brittany Elmslie may have been shocked to be called up to the Australian women's 4x100m freestyle relay team, but she produced a nerveless swim to help her team triumph over the Americans at the Pan Pacific Championships on the Gold Coast last night. The Aussies beat the mighty Americans in both the men's and women's relays, and won four gold medals to the US' three on a golden Saturday night at the outdoor venue. It was the first time for 12 years that the Australians managed to beat their American counterparts in both Sprint relays. Elmslie was brought in to replace Glasgow Commonwealth Games golden girl, Emma McKeon. World champion Cate Campbell led off in 52.89 seconds to give her team a lead, handing off to Elmslie (53.72sec), before Melanie Schlanger delivered another outstanding relay split (52.97sec), and Bronte Campbell finished truly (52.88sec). Their final time of 3:32.46 seconds was 1.48sec outside their world record, but almost two seconds ahead of the Americans (3:34.23). "Standing behind the blocks with these three other girls, after they broke the world record in Glasgow, I didn't know it was possible for me to be alongside them tonight," Elmslie said. "I just did my own thing and it inspired me I guess." Elmslie, 20, and just 18 when she was part of this team's gold-medal effort at the 2012 London Olympics, said the advice from her senior teammates was to just enjoy the ride. "There's always a rivalry with the US," she said. "Basically it was go out there and have fun tonight. It was no expectations. With the weather, we weren't expecting a world record. "I was just stoked to even be there. I wasn't supposed to be there. "Going into the final at London I was only 18." After the triumph of the Aussie women, the men followed by beating an American team featuring legends Michael Phelps, Ryan Lochte and Oympic 100m freestyle champion Nathan Adrian. The team of James Magnussen, Matt Abood, Cameron McEvoy and Tommaso D'Orsogna started as underdogs, but Pan Pacs 100m champion McEvoy led them home. Australia's winning time was 3:12.80, ahead of the US (3:13.36) and Brazil (3:13.59). D'Orsogna said his team was now set to pose a threat at next year's World Championships, and then the Rio 2016 Olympics. "Unreal. Those guys are fierce competitors when it comes to the relays. Everybody knows that Team USA is always going to compete 100% at every race," he said. "Getting to swim on home turf was our real advantage. "Cam's been having some cracking swims over the past month, but Lochte was going with him and you never know what that guy can do. "At about 10 to go I yelled 'we've got it' and started to get a bit excited." All was not lost for Phelps though, the man who has won a staggering 18 Olympic gold medals winning the men's 100m butterfly in 51.29 over Lochte (51.67). After winning gold in the men's 4x200m freestyle relay, Phelps won his first individual event at a championship, since making his comeback earlier this year. At 29 and after an 18-month break, this superstar of the pool is still capable of winning more gold at next year's World Championships, and then the 2016 Olympics in Rio. "It feels good to be back up there individually. It's been a struggle getting back," he said. "I didn't do it for any other reason than I wanted to be back. "It felt pretty good. It definitely felt pretty good to see the No.1 next to your name, and not second. "I think one of the things I have trouble with is holding my stroke at a fast distance. "It's just going to come with me doing more fast swims and faster things in workouts." Meanwhile, Park Taehwan of Korea won the men's 400 freestyle with a time of 3:43.15. Japan's Kosuke Hagino finished second for the silver medal with his time of 3:44.56, followed by America's Connor Jaeger with the bronze at 3:45.31. Thomas puts Pan Pac 200m freestyle win down to "long arms"